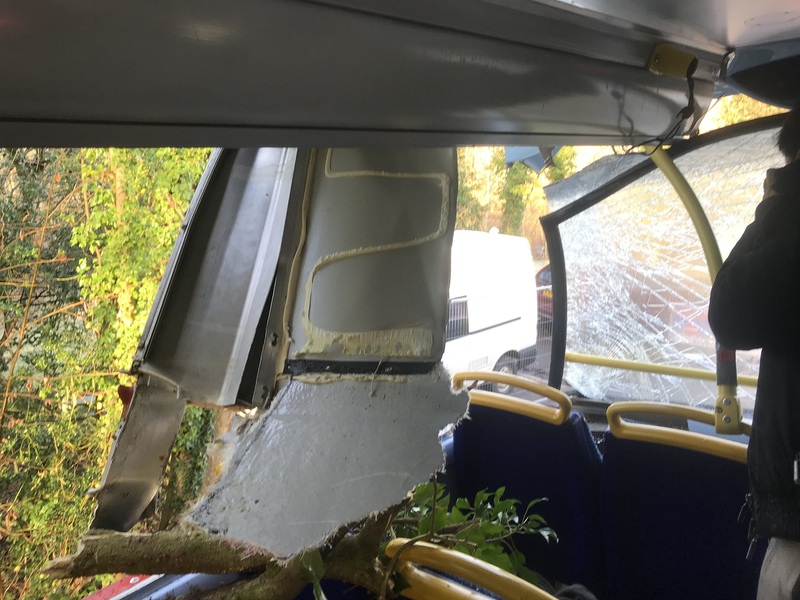 The roof of a rail replacement bus carrying Brighton commuters to Three Bridges was ripped off after the bus crashed into a tree this morning. A branch ripped through the top deck, smashing the glass and lifting the front of the roof as it was leaving Balcombe Station. Luckily,nobody was badly hurt, with just two people requiring treatment from paramedics for minor injuries. One passenger, who was travelling from Preston Park, said: “It was pretty terrible. The bus driver was going way too fast down a small forested lane (should never be driving down there in a double decker anyway) and hit a tree. “There were several bumps and bruises and one guy cut hit his head. 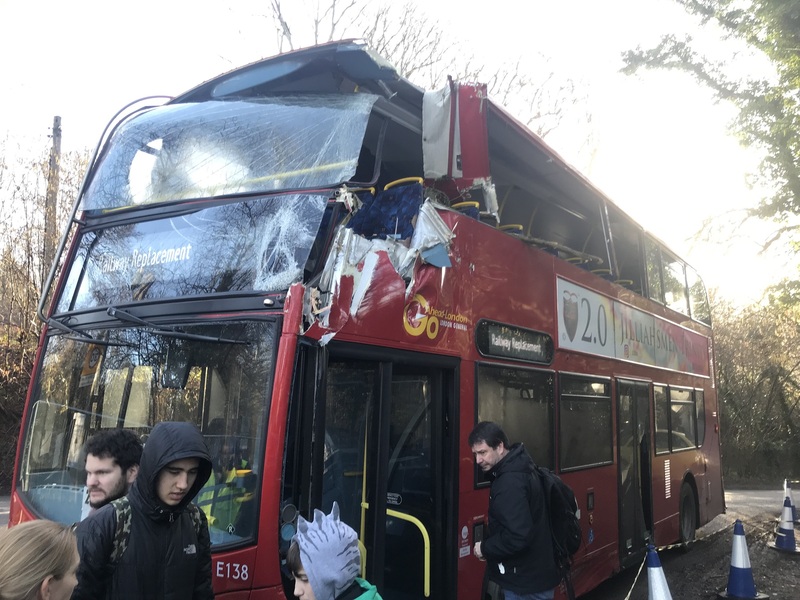 A police spokesman said: “Two people suffered minor injuries after a bus was reported to have hit a tree at Balcombe on Tuesday morning (February 19). A spokesman for Govia Thameslink Railway said: “I can confirm that a rail replacement bus hit a tree south of Balcombe station this morning. It was travelling along the same route that has been used since the works began on Saturday. “The emergency services have attended. There were up to 10 people on board. The buses are being provided by Govia while the Brighton mainline is closed between Brighton and Three Bridges for nine days while Network Rail upgrades the track as part of a £67m project. The rail replacement bus service has also been deluged with complaints from Brighton and Hove commuters who are angry that no direct buses to and from Three Bridges are being provided, with all services stopping at every station. Instead, Brighton passengers are being advised to take a service diverted via Littlehampton, which takes two and a half hours to get to London. Passengers using the rail replacement buses have also reported drivers unfamiliar with Sussex roads taking wrong turns, adding yet more time to their extended journeys. A spokesperson for Govia Thameslink Railway said: “Network Rail’s reliability improvement work is progressing well. Overall, our alternative transport arrangements have also been going to plan, with few queues, over 200 extra passenger assistants and praise for our teams on the ground from many passengers. “At Brighton, the best alternative for passengers is our twice-hourly train. We also have contingency buses to relieve pressure on trains and to keep passengers moving if crowds build up somewhere on the network. “There is an option to run them non-stop as we did on Saturday, to clear crowds attending the big football match, but this can only be if we have capacity to accommodate the numbers interchanging at Three Bridges which is very difficult on weekdays when there are many more people travelling. Your headline blames the tree. Shurely shome mishtake? It’s all very well putting on replacement buses but most of the roads they travel down aren’t meant for Double Deckers or anything that big for that matter. And yes, I agree, they are going way too fast. The sight of the bus was like a red rag to a tree.